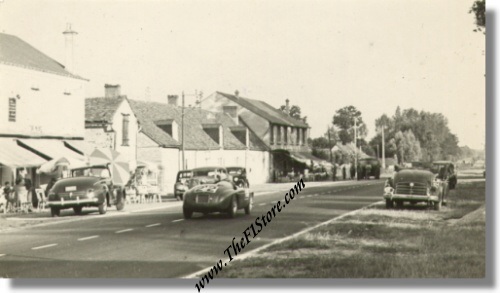 Vintage 1949 photo of Ferrari 166 MM Touring Barchetta S/N 0008M Returning from Le Mans. This photo shows the being driven back to the garage after winning the 1949 running of the 24 Heures du Mans with Luigi Chinetti and Lord Selsdon. The car in question is S/N 0008M and now resides in the USA. The photo measures some 5.7 x 3.25 inches and is in excellent condition. Only 1 available and a VERY rare opportunity.